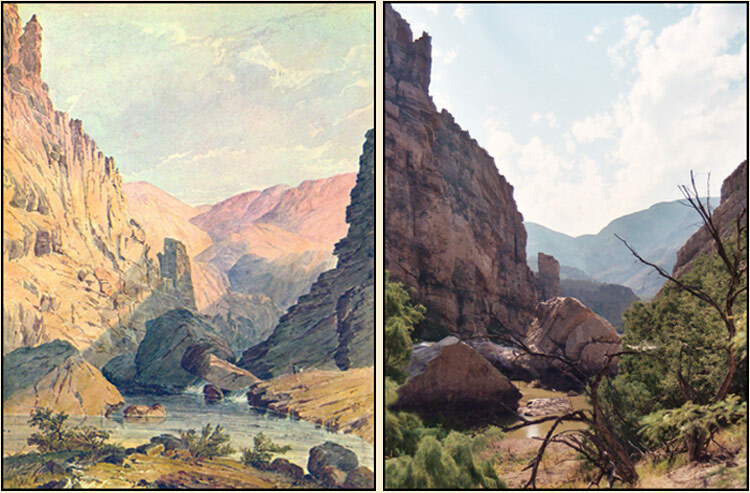 Eastman’s watercolor above was made in about 1853 from an 1851 field sketch done by an artist in the survey party, possibly Frank Wheaton. An interesting point here is Eastman’s depiction of the direction of the river flow. His watercolor shows the river flowing toward the viewer when it actually flows the opposite direction. Eastman was never at the site and obviously guessed wrong about the river flow. This canyon is indeed impassable whenever the river is flowing. The canyon here narrows to only about 150 feet from wall to wall. The astonishing accuracy of the field sketch and the watercolor suggest that the field sketch was made with the help of a camera lucida.